Peter J. "Pete" Krug, age 78, a resident of Naperville, IL and Naples, FL, formerly of Downers Grove, IL, passed away peacefully on Monday, January 14, 2019 surrounded by his children. He was born on February 29, 1940 in Milwaukee, WI. Beloved husband of the late Susan M. "Susie" Krug (nee Eichenseer), whom he married October 17, 1964 and who preceded him in death on December 24, 2015, loving father of Stephanie Krug of North Aurora, IL and Peter (Holly) Krug of Naperville, adored grandfather of Grace and Charlie Krug, devoted son of the late George and Julia Krug, dear friend of many. Peter grew up in Burlington, WI and was a 1958 graduate of Don Bosco High School in Milwaukee, WI. He received an associate's degree from Lyons Township Junior College (now College of DuPage) and went on to serve in the U.S. Marine Corps and later the U.S. Marine Corps Reserve. Pete worked for many years in the food ingredient industry and started his own business, CIFII in Downers Grove (1986), and later, Fontana Flavors in Aurora, IL and Janesville, WI (2003), which he operated with his son, Peter. Pete was a former member of Our Lady of Mt. Carmel Catholic Church in Darien, IL and Holy Spirit Catholic Community in Naperville. He was a current member of Our Lady of Mercy Catholic Church in Aurora, IL, St. Agnes Catholic Church in Naples, FL and Saint Benedict Catholic Church, Lake Geneva, WI. He enjoyed traveling, playing tennis in his younger years, and was a member of Heritage Bay Golf and Country Club, Naples. 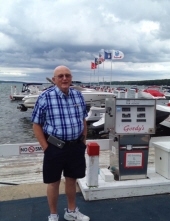 Pete had a passion for boating and spent many days on the water in Florida and Wisconsin on his vessels: "For Pete's Sake" and "This is It!!" Visitation Tuesday, January 22, 2019, 4:00-8:00 PM at Friedrich-Jones Funeral Home Cremation Services, 44 S. Mill St, Naperville, IL. Services will begin Wednesday, January 23, 9:00 AM from the funeral home and will proceed to a 10:00 AM Mass of Christian Burial at Our Lady of Mercy Catholic Church, 701 South Eola Rd., Aurora, IL with Rev. Hugh Fullmer officiating. A luncheon reception will follow the mass at Clara's, 6550 IL-53, Woodridge, IL 60517, (630) 968-8899. To send flowers or a remembrance gift to the family of Peter J. "Pete" Krug, please visit our Tribute Store. "Email Address" would like to share the life celebration of Peter J. "Pete" Krug. Click on the "link" to go to share a favorite memory or leave a condolence message for the family.